The City Deal is providing the funding to improve Sheriffhall roundabout. The chosen option has the Edinburgh Bypass going over an improved roundabout. Sheriffhall has been a traffic bottleneck for years and this is welcome news for residents, commuters, tourists and businesses. However, the initial public plans for Sheriffhall paid lip service to cyclists. Two years ago Midlothian View wrote an article Support the case to improve Sheriffhall. The Gorebridge Development Trust, led by Michaela Jackson, with the help of Spokes, the Lothian Cycle Campaign, also successfully lobbied the Scottish Parliament and were called to give evidence to the Transport committee. Consequently Transport Scotland now say the new Sheriffhall roundabout will be cycle friendly. In order to keep up the pressure and ensure residents were informed Midlothian and Musselburgh MSP, Colin Beattie, recently wrote to Transport Scotland for reassurances that cycling would be sufficiently included in the Sheriffhall roundabout plans. 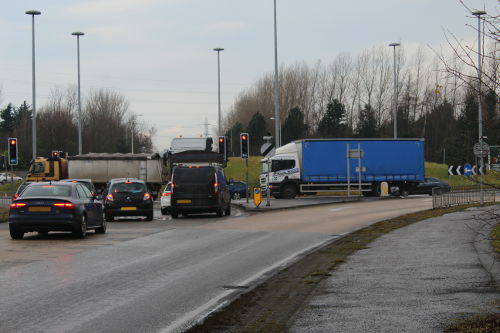 “We have undertaken extensive consultation with active travel stakeholders regarding provision for non-motorised users, including cyclists, at Sheriffhall and would like to reassure you that suitable provision for all users, including cyclists, is a key part of the proposed improvements to Sheriffhall Roundabout. “The preferred grade separated option will improve access for pedestrians and cyclists compared to the existing arrangement. Grade separation itself will allow the A720 Edinburgh City Bypass traffic to pass over the junction while significantly reducing congestion and improving accessibility for all modes of transport including pedestrians and cyclists. However, whilst it is great news that Sheriffhall will cater for cyclists, there is a real danger it will be an oasis of cycling perfection surrounded by totally inadequate routes. Spokes recently wrote to both council leaders and the Cabinet Secretary for Transport to make this point Spokes’ letter. Improvements to the routes between Edinburgh and Midlothian will not be funded. This is currently left to the local councils but as they are both having to severely cut their budgets by millions of pounds they are unlikely to be able to fund it. Therefore, Midlothian resident Laura Cockram has started a petition to ask Michael Matheson, Cabinet Secretary for Transport, Instrastructure and Connectivity to fund an integrated project to improve cycle routes. “I cycle to work (Dalkeith to Edinburgh). I do it because it helps my mental and physical health. It’s faster than driving and way faster than the bus. As the Gorebridge Development Trust and Spokes have shown it is possible for Midlothian residents to successfully lobby the Scottish Government. Midlothian View supports the campaign to improve the cycling routes around Sheriffhall and is calling on everyone to show their support by signing the petition. When roads in Midlothian are gridlocked every morning and evening with rush hour traffic it just does not make sense not to invest in cycling. Drivers should be able to swap their cars for their bikes. Many would like to but until the cycling routes are safe they will not do it.